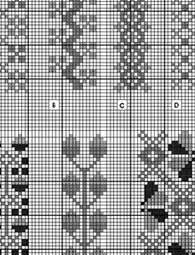 Embroidery Patterns for Historical Needlework – Great Resource! Here’s a great textile and embroidery resource for anyone interested in historical embroidery, counted thread techniques, or costuming. This site has it all – embroidery designs, fashion plates of historical costumes, and lots of interesting articles and tidbits about historical textiles. The website is called DragonBear, and it touches on fine arts, crafts, items of historical and literary interest, and “whatever else” they decide to put on their site! It’s a pretty broad spectrum, so there’s plenty of material for a good browse-through. Of particular note for the embroiderer is the patterns section of DragonBear. Here’s where you’ll find plenty of historical embroidery patterns, especially in counted thread techniques. Be sure to check out Designs, Period in the links at the left side of the Patterns section. In that section, you’ll find heaps of plates of different motifs for embroidery. They’re fun to browse through, inspirational, and useful! You’ll find detailed charts for borders, medieval motifs, and much more! There are over 250 designs in this section alone, and the designs come from different countries throughout medieval Europe. While you’re at DragonBear, check out the Strawberries pattern, which is listed first on the Patterns section. The idea for this sampler is taken from a work in the Victoria and Albert Museum. It calls for several types of stitches – not just counted thread stitches – and silk and metal threads. 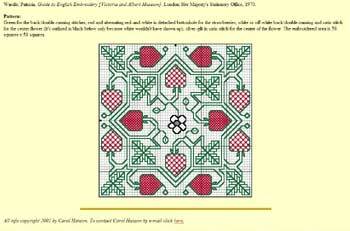 Other embroidery patterns include 16th century needlework Germanic borders, which are charted out for the embroiderer. They’re simple designs, but versatile. Besides embroidery, you’ll find a heap of other stuff: cordial recipes (both the historical ones and the modern adaptations), articles on different aspects of medieval history, and, for those interested in historical costume, a great section of costume plates that span the Anglo-Saxon through 16th century in English costumes. I’m adapting one of the designs from the Designs, Period section for a small linen bookmark. I think it will look very nice, and it will make a great gift for upcoming graduates. 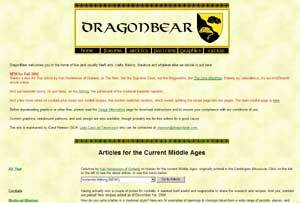 Have fun browsing through DragonBear! Next Next post: Video Tutorial for Bullion Knots!